Bucks® Fabricating is a leading producer of Contractor Duty containers. Whether you have a hook-lift or a cable pull system, we have the experience to provide you with a container that will prove its worth for years. 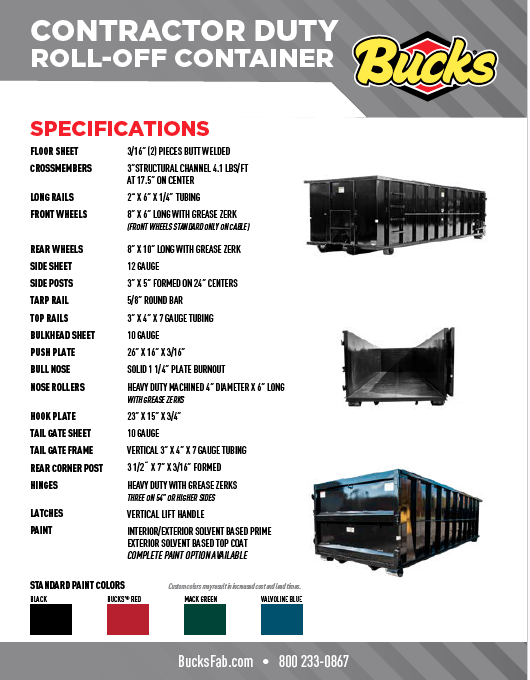 Our most popular and versatile roll-off container, the Contractor Duty is a great solution for any fleet. Whether you are hauling mulch and brush for your landscape business, construction debris or need containers for your rental fleet, the Contractor Duty is the box for you.